During a visit to London, Puccini witnessed a performance of the little play, "Madam Butterfly," an adaptation by David Belasco of the magazine story so entitled by John Luther Long. That gifted artist, Miss Evelyn Millard, enacted the part of the heroine with rare feeling, and the composer was charmed and touched by her performance, though he knew no English. Returning to Italy, he commissioned Messrs. Illica and Giacosa to write a libretto on the subject. In order to provide fuller scope for Puccini, the librettists placed a new Act in front of the English drama. Besides affording, by its prevailing brightness, a fine contrast to the pathos of the second part, this addition enabled the listener to obtain a better knowledge of the circumstances leading up to the tragedy of the last scene. 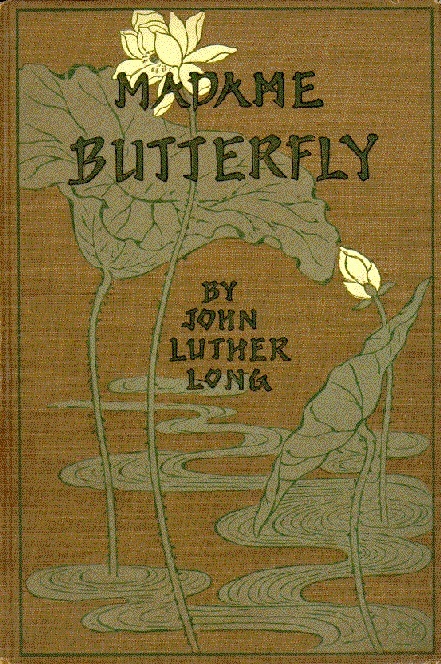 The cover of the book version of the short story, Madame Butterfly by John Luther Long (Grosset and Dunlap, 1903). This short story was first published in the Century Magazine in 1898. It was transformed into a play by David Belasco. Puccini was saw this play in London, England, and was inspired to write the opera. The work was produced at La Scala in 1904, but for some unknown reason, perhaps because of its unfamiliar Japanese character, it failed to please, and was withdrawn after one performance. It was then condensed, divided into two Acts (having been originally played in one), and the tenor air added in the last scene. A few months later it was given at Brescia in its revised form, when it was received with tumultuous applause. In July 1905 the opera made a most successful debut at Covent Garden, Destinn, Caruso, and Scotti playing the principal roles, and ever since it has been a great favourite with all classes of the musical public. The fine English version of the libretto, made by Mrs. R. H. Elkin, and admirably fitting the accentuation of the music, was sung for the first time at Washington, in October 1906, by Henry Savages Opera Company; and shortly after, it was presented at the Garden Theatre, New York, where it ran for three months to crowded and enthusiastic houses. In the summer of 1907 the Moody-Manners Company gave the first performance in English in Great Britain at the Lyric Theatre, London, Mdme. Fanny Moody impersonating the heroine, with Joseph OMara as Pinkerton, and Llewys James as the Consul. It has been played in all the principal cities of the Provinces by this Company, and everywhere the verdict of London has been confirmed.